Our employees are knowledgeable and dedicated. Whether they are processing mailings, shipping and receiving or supervising the operation, our people do the job right. We care about the work we do and the businesses we serve. We are really proud of our staff. 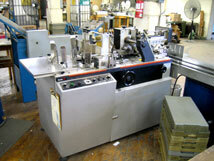 Fast and accurate, on the latest model Cheshire labeling machines. Three, four, five and up label formats are acceptable. These machines give us added capabilities in addressing and barcoding mail to take advantage of automated postal discounts. 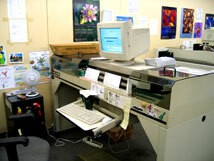 This equipment also gives us the ability to imprint codes and fixed messages, as well as to number sequentially. 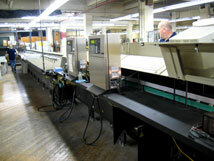 We have large volume modern multiple-station Pitney-Bowes inserters capable of handling up to 6X9 booklet envelopes. High speed, scoring, perforating, slitting and trimming of all mail pieces on Baum Folders. Cutting custom continuous computer forms with precision and speed. 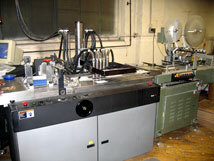 Automatic affixing of pressure sensitive decals, tabs, foil seals and other label stock. Automatically closes booklets, double postcards and self mailers in order to qualify for automation postage discounts. Affixing real stamps and/or metering postage to mailing pieces automatically. Accurately processed to meet current postal requirements for all classes of mail. Special sorting to take advantage of postal discounts. Special handling for mailing requiring samples, oversized pieces, exact matching of computer addresses and fulfillment services of literature and product. Daily delivery to the Youngstown post office, as well as delivering to Sectional Center Facilities such as Akron, Cleveland, New Castle, Pittsburgh's Bulk Mail Center and local destination delivery units, to take advantage of drop shipment discounts. All mailings are accomanied by computerized documentation. Capable of storing over 1,000 pallets. Efficient indoor docks in any weather. We provide comprehensive lists for both customers and businesses. Postal Mail-Sort Ltd. can offer customers services such as data processing labels, printing, envelopes and much more. We strive to help our customers get the services they need to complete their mailings in the most expeditious manner. Print personalized letters 1 or 2 sided, forms, etc. especially for banks, colleges, service companies and non-profit organizations. Printing capabilities include small format short run-up to 6 color, and full size sheet fed printing with critical color matching ability up to 8 colors.